Are you ready to welcome a new theme released on Themeforest from WpOpal? We’re so proud to provide you Coworkshop – the best solution for coworking, open office and shared working space that serve for multiple purpose such as meeting, conference, team planning, etc. On this occassion, we’re willing to offer you the best promotion – big sale off on Coworkshop. With only $29 (discounted from $59), you can own the best creative & inspiring coworking center WordPress theme with a lot of powerful features. If your business is related to Co-Working, Open Office, Handcraft Studios, Creative Space, Corporate Business, Coworking Spaces, Meeting, Conference Space Rentals, etc. Coworkshop will be a must-have WordPress theme for your website development. Why will you fall in love with Coworkshop? This coworking space WordPress theme will satisfy you with creative and modern design. It’s fully responsive and retina-ready on any device. Moreover, with 06+ ready-to-use homepage layouts, 02+ functional shop pages, and 04+ well-organized product page layouts, you are free to create your own stunning website. What’s more? Your sharing office business will be equipped with comfortable workplace and well-prepared workshops, conferences or business meetings. Thanks to multiple powerful plugins integrated, especially the best Elementor drag & drop page builder, Coworkshop Woocommerce WordPress theme is featured by lots of advanced functionalities. Let’s explore some highlight features of Coworkhop – Coworking Center WordPress theme! Coworkshop offers you 06+ great homepage layouts with full website demos imported by 1 click. Each homepage will meet your demand for building coworking space, private office, creative space, and creative coworking startups with modern interiors and comfort. A modern and comfortable working space with various options of convenient facilities and relaxing service offer will engage increasingly numerous customers. Your customers will love your meeting and conference service reservation with smart setting, natural light, high-speed internet, industrial style interior, etc. One of the most effective strategies to enhance customer loyalty is creating various membership options. The WordPress theme Coworkshop allows you to set ”hot” membership packages with different price and benifit for your different customer groups. With the responsive coworking space WordPress theme Coworkshop, you can create and manage event booking system with ease. 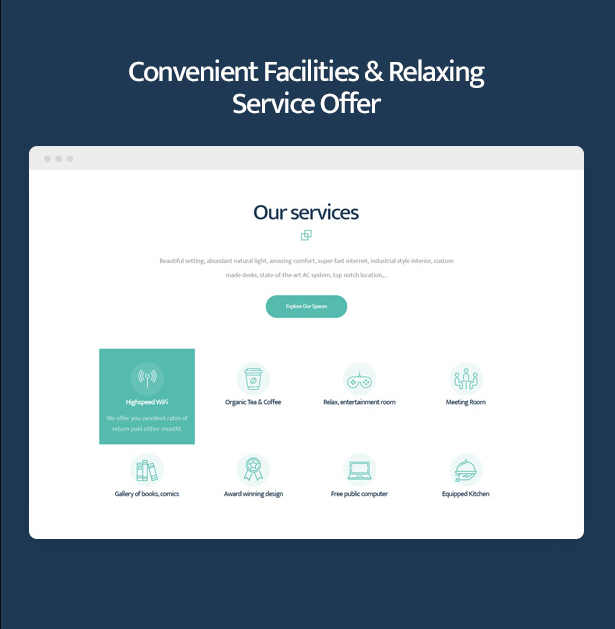 It’s super easy for customers to contact to book for any event or meeting with all necessary information such as time, topic and requirements. 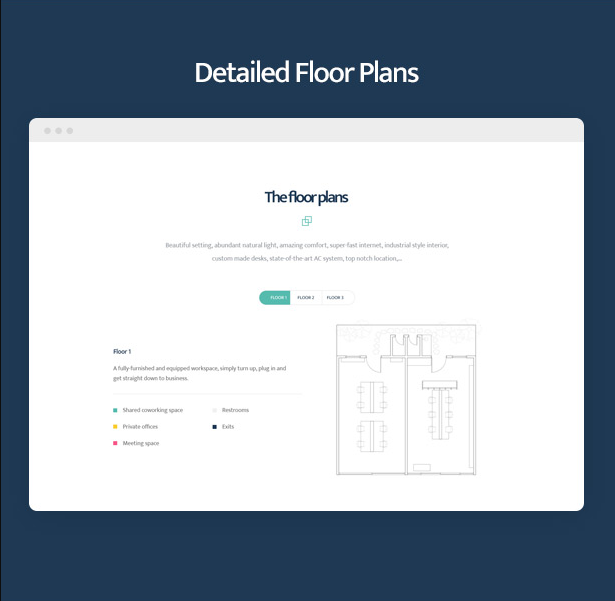 By showing floor plans with details of space arrangement and function, Coworkshop will make your clients feel convenient and familiar with your public office. Let’s engage more customers with well-organized and inspiring open workspace. In addition to above outstanding features, Coworkshop comes with fast performance, SEO-friendly optimization, multiple language support, 1-click installation and ease of customization. During the time of using our theme, if you face any issue, please contact us via ticket system or email: help@wpopal.com. Now Coworkshop the best coworking space WordPress theme is available on ThemeForest with Big Sale Off. Note: $29 is coming to an end so hurry up!! !